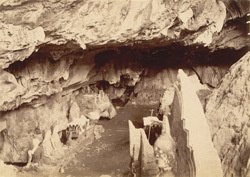 Photograph from the Curzon Collection of the interior of the Farm Caves near Moulmein (Mawlamyaing), taken by the studio of Watts and Skeen during the 1890s. Also known as the Ka-yon or Payon Caves, the Farm Caves are situated in the limestone hills that rise from the plains to the east of Moulmein, and were used as Buddhist cave temples. Rock-cut temples and cave shrines such as these are found in both Buddhist and Hindu art: among the stalagmites and stalactites, the rock surfaces have been carved and decorated with religious imagery, and carved images of the Buddha stand on the bedrock of the cave floor. This view shows the deteriorated condition of the interior and sculptures, many of which have been removed, destroyed, or mutilated.